You know that time when you decide to start decluttering, throwing stuff out sorting the rest back into some nice neat drawers and admiring your handy work all around the house, just to realise a few hours into your proudness of all the work you have put in….there is still one place which is yet to be tackled and yep its probably the worst dumping ground of all…the GARAGE! The place where you “store” things, move stuff out of the way with full intentions of sorting through it and putting it into the relevant boxes and then somehow just forget about it! Don’t get me wrong i absolutely LOVE having a Garage but its probably the most organised chaos of a room as much as i try once a year to clear it all out, dump things and put it neatly back into it a few month onto that its back to the “lost world” again! 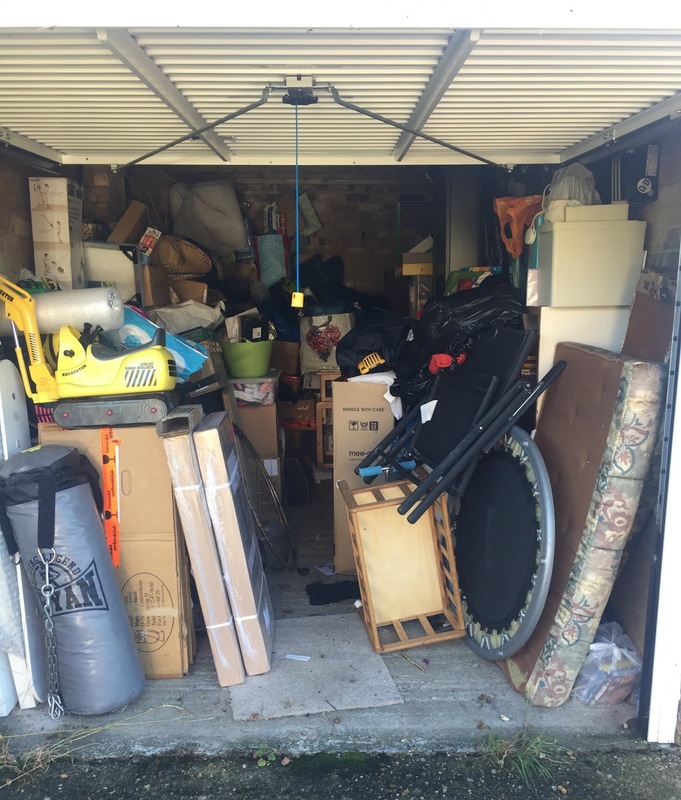 When we use to own our flat we first hired a storage unit which was a pain in the bum with driving there to get stuff especially when you send your other half and he has no clue how your unorganised mess “system” works! A couple of years on we where lucky enough to start renting a garage from a fellow neighbour and the “holding” began! When we moved to our current rented house it was a nightmare and one hell of a task to move the entire garage with us and i wish i did a ruthless decluttering session beforehand because it wasn’t something i was very keen on doing amongst wedding planning (with the big day being only 6 weeks away at that point) plus looking after the kids and unpacking thousands of boxes! i got rather exited by the email! Exited by Garage shelving you say??? Yep it was just like a kick up my backside but in a VERY positive way. 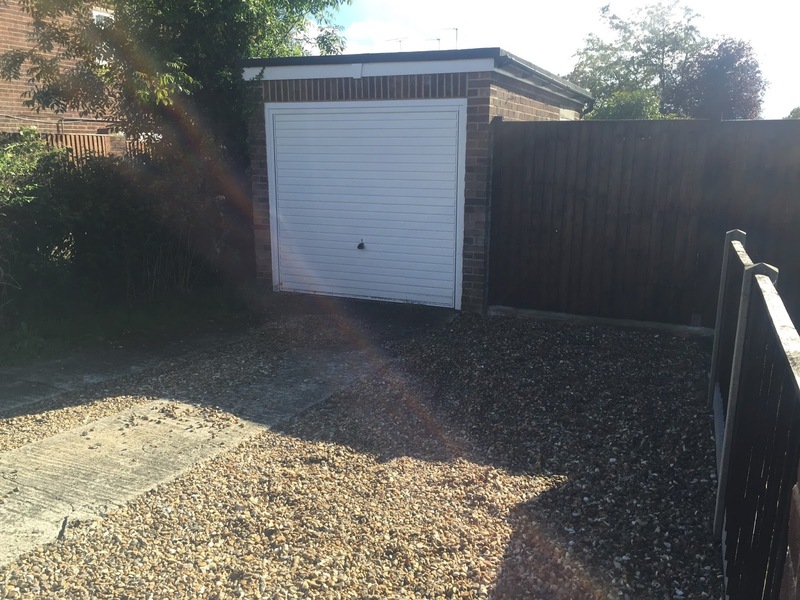 I finally got the push i needed to get started on decluttering and reducing the content of our garage ready for our big move next year! So thank you very much Tufferman for making that finally happen! And even better i let you in on a few tips and tricks along the way whilst doing so! Now hold on, i am not saying this will be happing in the couple of weeks since i had that “YIPEE” email (yes indeed i got very exited to have been chosen to show you some of Tufferman’s range!) i must be getting old or that slight bit of crazy organising german lady i have in me is finally coming back to me! Even better bring it on! 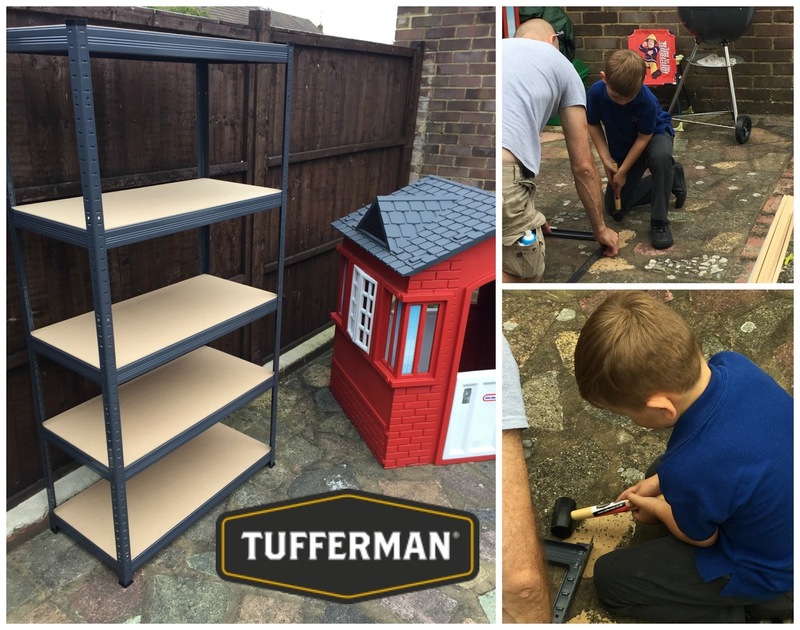 One fine Wednesday afternoon (of this week) i flattered my eyelids at my husband and he kindly agreed to build me 1 out of the 3 Shelf’s i received from Tufferman to test, after all Mr. C. was very keen to head to Spain for his annual golf trip (just saying….). under 30 minutes time – not that i timed it at all, no never!! He couldn’t find the instructions i told him there might be in box 2 or 3 but he decided to try it without it, fair enough! But lucky for him the Storalex shelving units are meant for quick bolt less assembly and even comes with a free rubber mallet! So here are some pictures of the finished shelf and my first thoughts on it are that next to the easy assembly without any screws (which might get lost in the building process especially if children’s hands are involved with it) the shelf build in all its glory looks sturdy enough to hold all my very important stuff that i never look at – useful boxes of neatly organised things which is staying! Now that would be Part 2 which will be coming to the blog very soon, well as soon as Mr. C.
is sorting the crap out of that garage!! But in the meantime i leave you with a beautiful picture of the inside of my garage! Have i told you its messy and unorganised and NOT safe for the children to come in and join me looking for something very important which just don’t want to be found! which is a pretty decent price for 3 shelfs all together, not that i am an expert in garage shelving all of a sudden but Mr. C. said so and hey after all its all his electrical equipment which takes up most (*cough* ok maybe 35%) of the space in our garage needing some where to be put on!